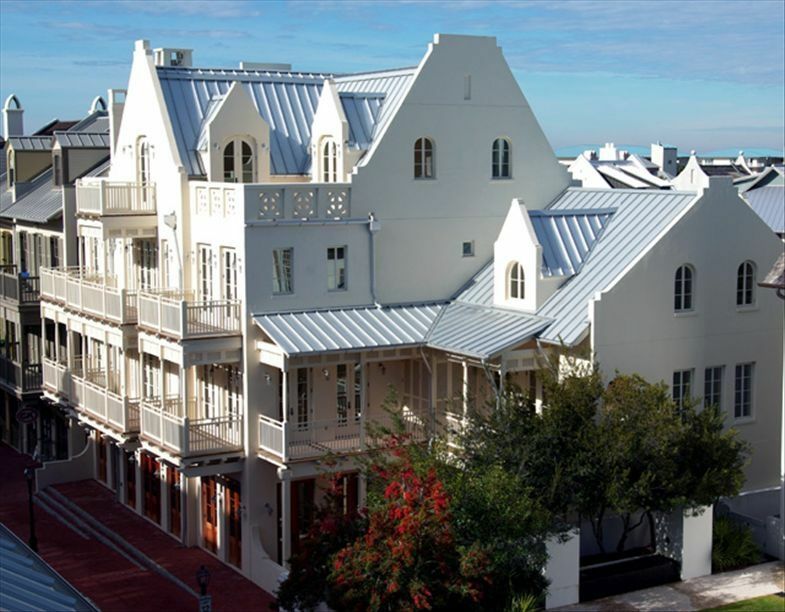 Rosemary Beach is at the forefront of all the coastal communities along the Gulf. The beach side environment and classic small town atmosphere make this picturesque community one of the most highly sought after vacation destinations on the Emerald Coast. Located on the south side of Highway 30A in the heart of Rosemary Beach, The Soleil is the most stunning building on Main Street. With unobstructed Gulf views from each available unit, European style architecture and town center location, The Soleil is sure to be one of the most sought after vacation rentals in Rosemary Beach. Step into the sun and enjoy the warmth that Rosemary Beach has to offer. Unit 2A is a one bedroom, one bath condominium with approximately 672 sq. ft. of interior living space exquisitely furnished by nationally renowned Lovelace Interiors. The unit also boast 312 square feet of outdoor living space to enjoy the warm breezes, views of the Gulf and Rosemary Beach. The living and dining room are decorated in a soothing turquoise and warm tan décor highlighted with a cozy banquette, colorful artwork, and unique accessories. The well-equipped kitchen is also open to the main living area with doors opening out to the private terrace perfectly furnished to provide ample space for relaxing, entertaining, and enjoying the beautiful sunset. The delightful master bedroom offers a private balcony that faces Main Street, perfect for greeting the day while enjoying the sunrise and morning coffee. The unit features key less entry/access, travertine tile throughout, granite counter tops, impact rated windows and doors, elegant beach chic interior design, Heavenly Beds, flat panel televisions, wireless internest, washer and dryer, and reserved parking. Enjoy all the amenities that Rosemary Beach has to offer: from four heated pools, eight clay tennis courts, fitness center, playgrounds, and nine deeded beach walkovers. The Soleil also offers complimentary beach chairs for the length of your stay to enjoy our beautiful beach. Take in the magnificent Gulf views while relaxing on your balcony during a lazy afternoon. Enjoy the sugar white sand and emerald green water just steps from your vacation retreat. Let yourself be immersed in all the splendor of the Emerald Coast. Welcome to The Soleil. Please contact manager before selecting online booking. My husband and I just returned for our second stay in this unit and brought our two boys (3 and 6) with us this time. It was a great size for us, we let the boys sleep on the pull-out. We loved that there was a pocket door to divide the master and bathroom from the living area so we didn't disturb our kids when they went to bed before us. We enjoyed a bottle of wine on the balcony and had fun people watching down below. The location could not be more ideal. It's a 2 min walk to the beach and directly above all of the dining. We rented bikes and only used them once. No need! It's a super quick walk to seacrest as well. We enjoyed lunch at seacrest sundries and dinner at pizza by the sea and walked easily to both. The property manager Carrie was great to work with and answered every question we had. We will definitely be back! My husband and I were looking for a spot for a quick getaway without our children. The Soleil was perfect. The unit itself was beautiful and very clean and the porches are huge. We rented bikes but only used them once to go down to Alys for lunch. All of our meals were either directly below us on Main Street or around the corner. So ideal. The beach was a very quick walk and we enjoyed the complimentary chairs and umbrella. Carrie was wonderful to work with and answered our endless questions promptly and politely. We will for sure be returning to this unit in Rosemary. The Soleil Is The Best Location In Rosemary! Just steps from the beach, pools, shopping and dining! Our Many Stays in 2A are perfect from entry to exit~ Carrie is Absolutely Amazing! Every detail of our stay is above and beyond anything we could want or need~ And the fun and most generous gifts left for us upon arrival are the icing on the cake! Thank You Carrie!! I Highly Recommend The Soleil To All!! The location right on the main road in Rosemary Beach, over a quaint shop, and steps to the beach, is ideal. No noise issues whatsoever even with this location in the midst of the action. Balconies on the front and back of the property mean there is always an opportunity to sit outside and enjoy great views - either people-watching or sunset view or gulf water view. Enjoy the live music coming up from Edward's restaurant while you sip wine on your private balcony. Superb furnishings, appliances, bathroom, electronics, cookware. A wagon and beach toys are available to borrow. The management is the best I've worked with - very attentive, generous (provided us an unexpected and wonderful gift upon arrival! ), flexible, and truly bend over backwards to make sure you have a fantastic stay! I highly recommend The Soleil in Rosemary Beach. After many trips to the area, this unit is now one of our favorites. As mentioned in earlier posts, the location is ideal and the space is decorated beautifully. Jeanine, the property manager, was wonderful and easy to work with. Can't wait to stay again! We selected the Soleil based on reviews of the unit and the management. This is a wonderful location in Rosemary Beach. Everything is provided, that you need. Jeanine does a fabulous job as manager. Every question is answered and every detail, is covered before you arrive. To our surprise, a special gift,was waiting for us. So many things were there that we had not expected. The small folding beach chairs, small cooler to carry water in, umbrella, beach toys, all paper products for the week, laundry and kitchen detergents, salt and pepper, coffee filters, etc! The unit is much bigger than it looks on the web. We really enjoyed the two decks. Overlooking Main Street is so much fun, and the deck off of the living room has wonderful furniture. The walk to the beach and Barbados pool was about 150 yards. The Cowgirl Kitchen, is fun and right downstairs. Edwards, Sugga Pies, La Crema Tapas, Summer Kitchen Cafe all great places we enjoyed eating at. Park the car and don't move it till you start home. Walk, bike, swim, relax. This is one great place. We are already looking at the work calendar, to plan our next SOLEIL VACATION AT ROSEMARY BEACH.